Tonight the Golf Road Warriors enjoyed dinner at the Fairmont Kea Lani’s Ko Restaurant– winner of scads of “best” awards for its great food and unexpected menu. 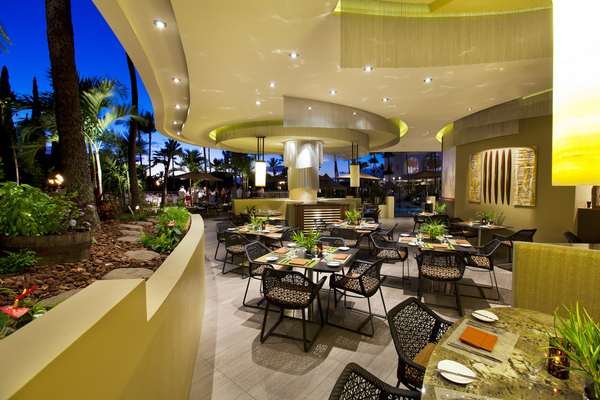 “Ko” means sugar cane, and it’s a sweet location to enjoy Executive Chef Tylun Pang’s take on the cuisine’s of a variety of cultures that have influenced Maui’s food scene from plantation days to the present. The menu includes family recipes from such cultures as Chinese, Filipino, Portuguese, Korean, Japanese, and others. Chef uses fresh produce, beef, and seafood sourced on the island. His cooking talents are only exceeded by his humility and charity work– he is the opposite of a celebrity chef but exactly what a celebrity chef SHOULD be. A recent $5 million renovation took what was formerly an Italian restaurant and turned it into a cultural and culinary experience that you won’t find anywhere else. Great starters making the rounds at our table of hungry warriors included Ahi on the Rock– sashimi spiced with an orange ginger miso sauce that we cooked on a hot rock at table, and the oishi sushi– a spicy tuna roll battered in tempura and quick fried, and possibly the only thing I’ll ever need to eat again. Continuing on in the fish tradition a good choice for dinner is the daily catch prepared one of six ways, including ginger steamed, grilled, or wok seared. Or perhaps the Zarzuela, which is not only fun to say but as entertaining as a variety show starring lobster, shrimp, scallops, mussels, clams, and chorizo simmered in a rich saffron broth. Ribeyes, lamb chops, paella, and other specialties are on order in addition to nightly fish specials, as well. If you ascribe to warrior Tom Bedell’s theory that we have a separate desert stomach and therefore room for sweets despite how much we’ve already eaten, try the Pao Doce Frito, a Portuguese sweet bread filled with coconut gelato, fried crisp, rolled in vanilla, and served with black raspberry jam. Kudos to Chef Pang for a feast fit for warriors. Even if they are golf road warriors. Best Brewpub in Oregon? Barley Brown’s in Baker City (yum, slurp, etc. )!